An exclusive discount that you won’t want to miss. We have some very exciting news at The Yorker. One of York’s most popular visitor attractions is collaborating with The Yorker to bring exclusive discounts to our readers. Said to be the most haunted city in England, The York Dungeon experience offers a look back at 2000 years of the city’s dark history. It’s a fun and interactive experience, perfect for those who want to learn more about the history of York, whilst being part of the action themselves. The Dungeon offers immersive sets and boasts an impressive 10 shows all with live actors, each with a brilliant story to tell. This is coupled with state of the art special effects, providing a glimpse into the lives of real historical characters in York. The 75 minute immersive experience is open to the public every day, making it the perfect activity for a quiet weekday when you fancy the chance to be a tourist in your own city. The attraction has been awarded a prestigious 4.5 stars on Tripadvisor, and the certificate of excellence, begging the question of most our students; why haven’t we been yet? The most popular shows include; ‘Fear of the Vikings’, ‘The Plague Doctor’ (we’ve heard its gruesomely theatrical), and ‘The Golden Fleece’, which is set in York’s most haunted pub (which you can visit in real life too). More can be found about each of their shows on their interactive website. 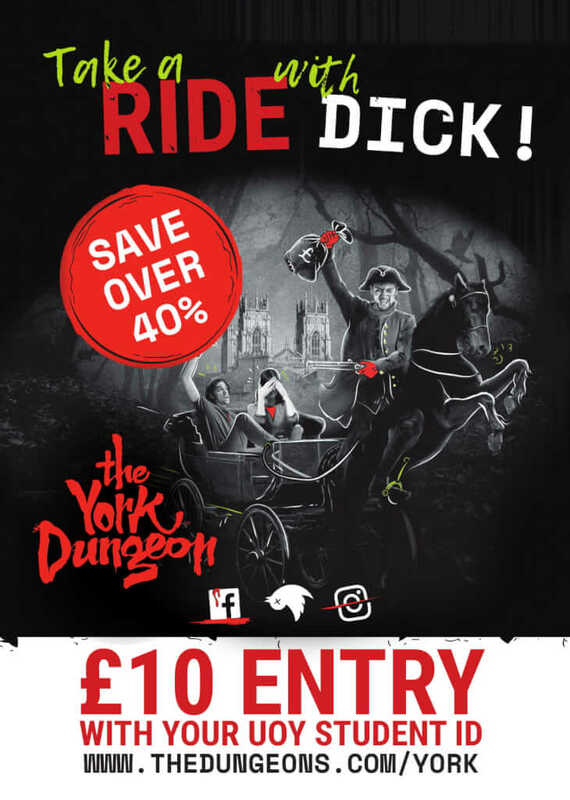 The York Dungeon is offering all University of York students over 40% discount on entry, a bargain £10 entry between now and the 31st of December 2019. Compared to the normal ticket price of £16.95, this is a saving that cannot be missed. All you have to do is show a valid University ID on entry. These dark, November evenings make the perfect time for a visit. The Dungeon would make an ideal venue for a Christmas night out, for an ice-breaking first date, or the perfect place to take friends and family when they visit York. The Dungeon can also be hired out for student events, so if you are looking for a place to hold a social for a larger group, it could be the perfect spot, offering a more exciting alternative to the local bar or pub, and at an extremely affordable price. The York Dungeon also have a calendar of special events throughout the year, including River Ouse Ghost Cruises and Late Night events, all being offered at a reduced rate for our students. Keep an eye out for all updates and offers on our site, you won’t want to miss them!